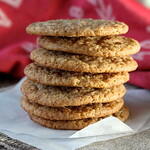 The recipe for these Multigrain Snickerdoodles takes the traditional cinnamon cookie and adds whole grains, including rolled oats, barley flour, and whole wheat flour. 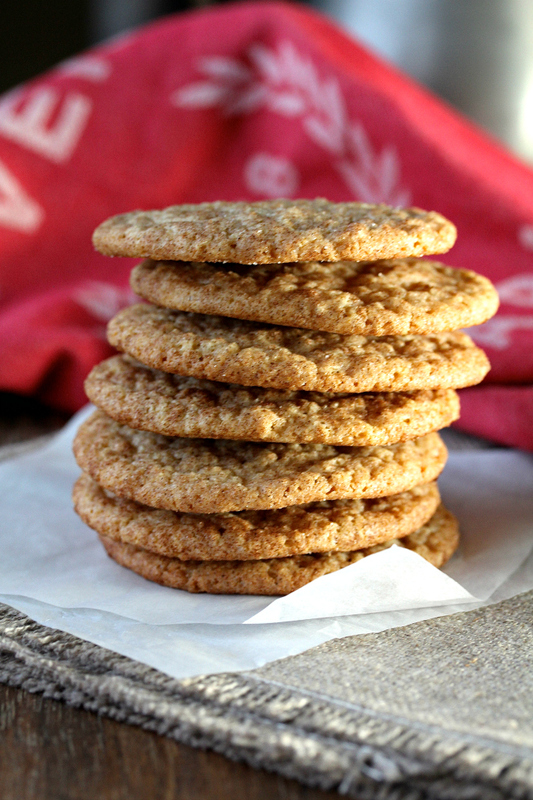 These Multigrain Snickerdoodles, made with 100% whole grains, are so tasty. All of the whole grains add lots of dietary fiber to the cookies. The barley flour adds a lovely sweet, nut-like flavor, the oats add texture, and the whole wheat adds more depth of flavor. These cookies can be either a little more chewy or a little more crispy, depending on how long you let them cool before placing them in an airtight container. If you let them sit out overnight, you will get crisper cookies. We went for soft, chewy cookies. They do look a bit floppy, don't they? Nevertheless, these cookies are delicious! I took about half of them to work and the cookies were gone by 9:00am. The rest of my family, including my grandsons, finished off the rest of these, and deemed them "the best cookies ever!" This month, the Creative Cookie Exchange group is making "healthy" cookies, however we define "healthy." I'm not a big fan of calling any food "healthy," (it's kind of a pet peeve) and prefer the term nutritious. These cookies are more nutritious than cookies made with all purpose flour, but keep in mind, there is still sugar.... and buttah!!! The reason cookies were invented. Either way, my grandsons had no clue that whole grains were involved in the making of these cookies... and I can pretty much guarantee that these were their favorite cookies I've made so far (well, maybe these Andes Mints cookies were, but these Snickerdoodles were a close second). Each cookie contains about 109 calories. Not bad! The cookie dough needs to be refrigerated overnight before baking. I learned that the hard way. The recipe from which I adapted these started with "Preheat the oven to 350 degrees F," and then, once I mixed up the dough, said "refrigerate overnight." Aaack! I dutifully turned my oven off and baked these the next day. 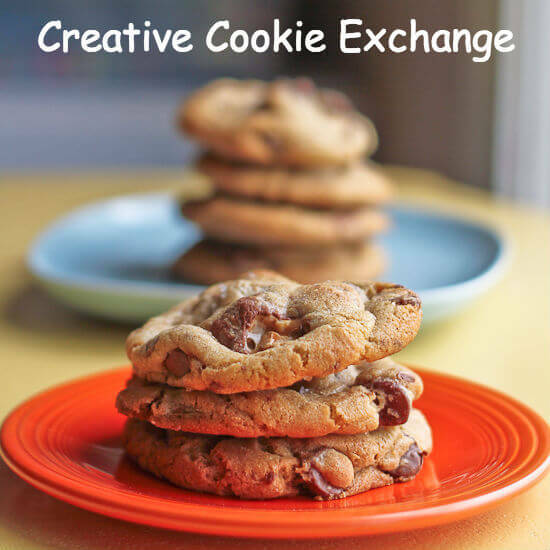 After the recipe, be sure to check out the rest of the "healthy" cookies from the Creative Cookie Exchange Bakers. You should also check out my other snickerdoodle recipe, these Browned Butter Snickerdoodles. 1/3 cup sugar plus 1 tablespoon ground cinnamon for the coating. Cream the butter, sugar, baking powder, salt, and vanilla in the bowl of a stand mixer with the paddle attachment. Beat in the orange juice and eggs. Scrape down the bowl and then add the oats, barley flour, and whole wheat flour. Beat until well combined and then refrigerate the dough, covered, overnight. Preheat the oven to 350 degrees F and line three baking sheets with parchment paper (you can also reuse the baking sheets, just make sure they have cooled completely). Add the sugar and cinnamon to a one gallon zip lock bag. Drop tablespoon scoops of the dough into the bag, six pieces at a time, and toss them in the coating. Place the coated dough onto the lined baking sheets, and press each piece down with the bottom of a glass, to 1/2 inch thick rounds. Repeat until you've used up all of the dough. There should be about 12 rounds per baking sheet. Bake the cookies, one sheet at a time, on the center rack of the oven, for 12 to 14 minutes. Remove from the oven and and transfer to a wire rack to cool. Repeat with the other two baking sheets. 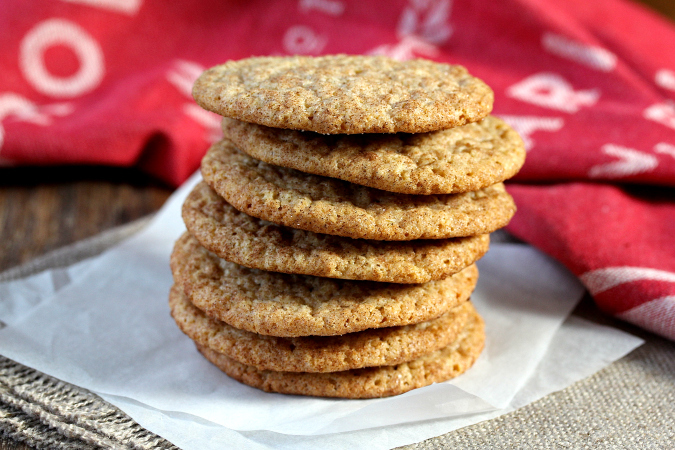 Love the idea of whole grain snickerdoodles! I've never tried using barley flour. Does it bake up the same as the whole wheat or is it just good to use in addition to. Hi Linda! This is my first time, but from what I understand, you can sub out about a third of your flour with it. It's quite tasty! Whole grain cookies are the best in my opinion. They have a lot of flavor and some great texture! They looks great, not floppy at all!! I need to experiment with other types of flours. If whole wheat and barely flour can create cookies like this than count me in! The kids had no idea there were whole grains in there! I loooove snickerdoodles but I rarely think to make them! These look so perfectly chewy! 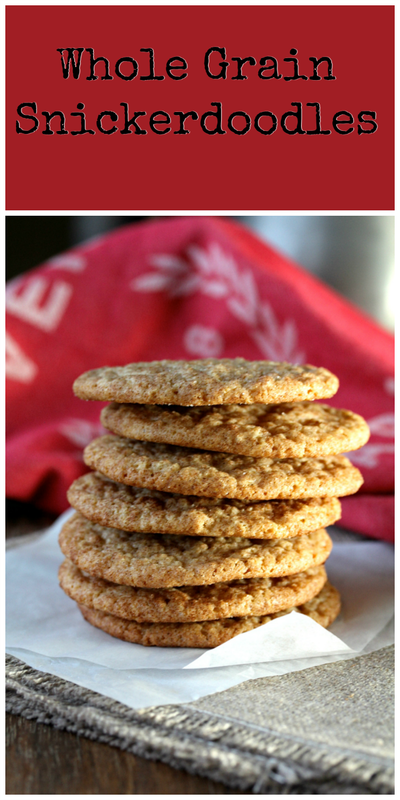 My family loves snickerdoodles, and I love the idea of adding some whole grains to them. I know I have some leftover flours from another baking project, and you inspiration may just give me the excuse to use them up.